"They're all superb! printing, folding, packaging, etc. Thanks again to all of you for delivering as promised... hold those files, there'll be re-orders we hope!" See images to the right to better understand the names of the folds. Or, see paper folding in action in the video below. While most of the marketing materials you see fall in the common 'standard' paper fold category, the possibilities really are endless - you're only limited by your imagination. Paper can be scored and folded into some pretty crazy shapes and sizes. Plus, creative folding can be a great way to stand out from the crowd with your next marketing piece. This fold is a combination of one folding style nesting into another. There is some flexibility here in choice of folding style, but the overall concept is that the "carrier" piece has an outside or inside inverted short fold - basically a short fold that folds up from the bottom, visible from either the inside or the outside of the piece. The short fold creates a "pocket" that can hold an additional nested piece (folding style optional). The end result is innovative and truly impactful. The stepped double parallel fold type is a fun modification on an old standard - the double parallel fold. The concept is simple - by shortening the cover and adjusting the lengths of the trailing panels, you can create a "tabbed" effect along one side. It's a fairly easy layout adjustment that will offer a lot of mileage from a creative standpoint. Another great accordion folding option (budget beware) is a wrapped stepped accordion with short cover. This is an innovative way to close one edge on the challenging stepped accordion fold, while maintaining the "tabbed" appearance that is so appealing. The short cover is optional - you could always make it flush if you needed to close the right edge, too, but the short cover really showcases the stepped panels. Imagine this: an accordion fold where some panels are shorter (in pairs), creating an interesting and varied zigzag profile while maintaining a flush appearance when folded. This is very exciting for promotional pieces or other special projects. Have fun with diecuts! Take the standard roll fold and apply a creative, tapering diecut to the roll-in panels and see what you end up with. The panels overlap and layer to create a wonderful visual texture. Whether the shape is simple and geometric, or varied and organic, this style has a lot of character. The paper you choose for your folded print piece is by far the most important factor in the folding process. Paper choice is not only for looking good, but also for functionality. A bad paper choice on a folded piece can have very disappointing results. For example, a large-sized brochure printed on thin paper will be droopy; a big, folded poster printed on card-stock will be wrinkled and won't lay flat. Give some consideration to paper choice - ask your printer for advice if you have questions about the best paper for your folded piece. It's essential to understand the characteristics of paper before you can understand how it will perform in the folding process. From a manufacturing perspective, folding paper can get a little tricky. Thanks to our veteran manufacturing employees here at PFL, you can rest assured that things like paper type, how the paper was milled, the fibers in the paper, and the grain of the fibers in the paper are all considered when your print piece is folded. We don't put up with bad printing folds! You can trust that the edges of your piece won't crack or tear, and your folds will be crisp and clean - your folded paper project will look like a million bucks! 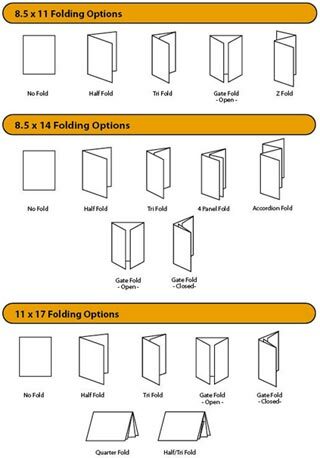 Need creative or technical advice on using custom folding? 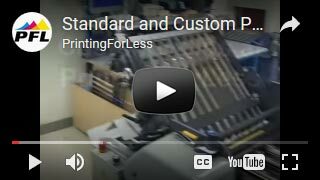 Talk to a print expert now at 800-­930-2423, or Request a Custom Print Quote. Learn more about our full line of custom printing effects and finishes.